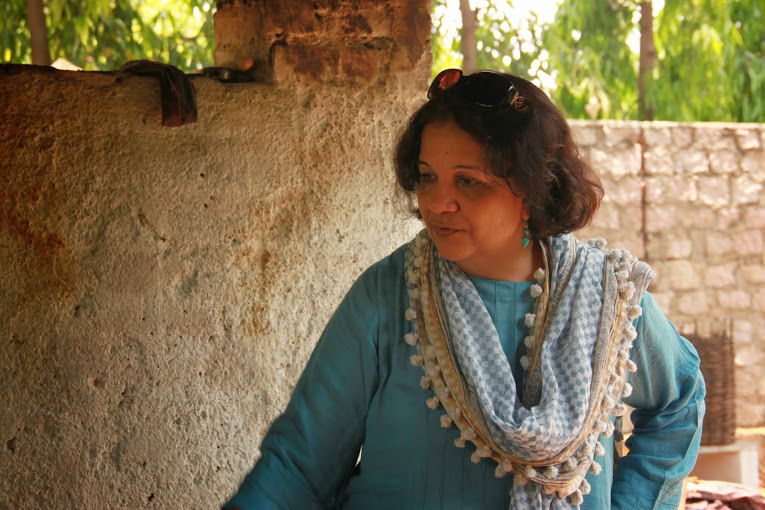 Designer and scholar Bina Rao, of Creative Bee, talks to Jaypore about her organic dye farm, collaborating with her artist-husband Kesav Rao, and starting off in Hyderabad at a time when it sorely lacked facilities for the creative folk… here are snippets from our conversation with her. Creative Bee’s textiles and apparel are produced by skilled weavers and dyers, who have been trained by Creative Bee in order to improve the quality of dyeing and weaving and also to translate traditional skills into designs, which are contemporized by Bina Rao, a designer and scholar on Indian textiles. The textiles are woven using hand-spun natural fibers such as cotton, linen, mulberry silk, tussar, gicha, noile, etc. that are hand-block printed/dyed at Creative Bee dye-farm, the brain child of Kesav Rao, an expert in natural dyes and an artist by profession. This Dye Farm is 100% organic and doesn’t use electricity at any stage of their printing or dyeing processes. 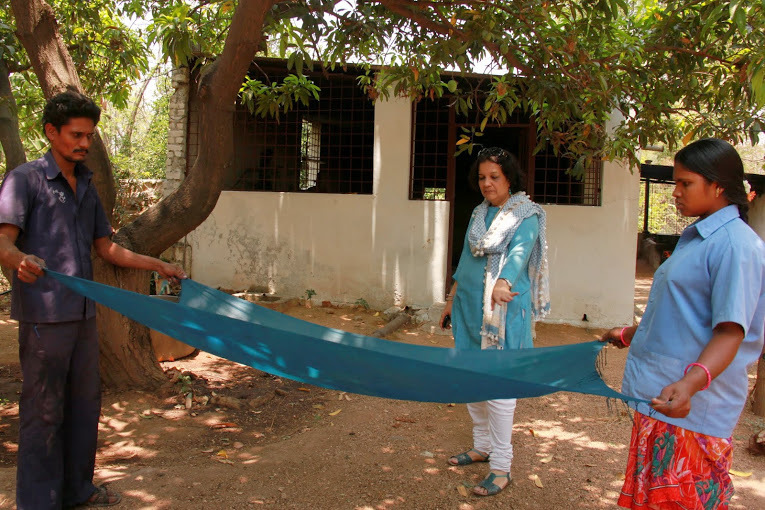 Several leading fashion designers in and around India have associations with Creative Bee, with the aim of producing ethically crafted fabrics as well as accessories. Additionally, Creative Bee has a tributary called The Creative Bee Foundation, which is a non-profit organization started by Bina and Kesav Rao aiming at not only sharpening and polishing the skills of rural artisans other than handloom, (wood, metal, fiber) but also helping them to attain a comfortable livelihood by finding an appropriate market and consistent work linkages. A wide range of gift-able products are designed by the team of Creative Bee designers and visiting fellow designers from around the country and abroad, and produced at micro centers of Creative Bee Foundation and marketed through their studio outlets across the country and through the buying houses who can directly buy from the artisans. Bina Rao, the Design Head and CEO of Creative Bee, holds an M.A. in Fine Arts (MS University, Baroda, Gujarat, 1981 batch) and has attended AEP Textile Design from 1981 to 1983 at the National Institute of Design, Ahmedabad, Gujarat, India. 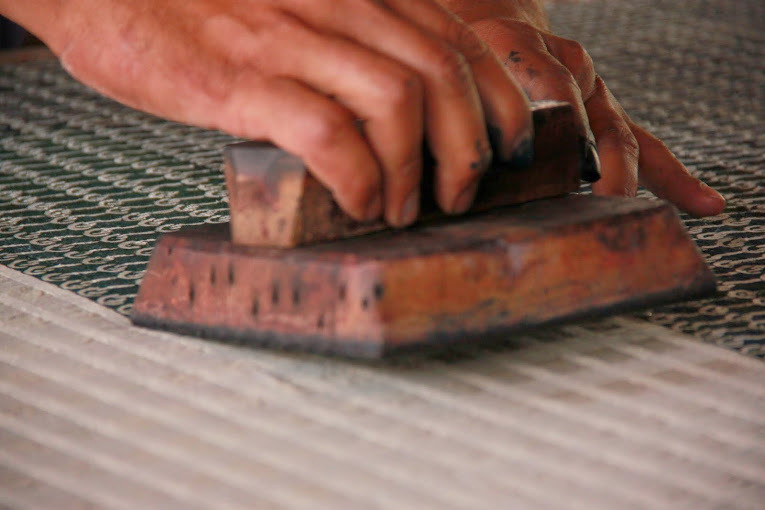 Kesav Rao has established an R&D and production facility for natural dye-print, reinvented the traditional hand-block [Kalamkari] technique. The Dye Farm of Creative Bee attracts number of researchers and textile enthusiasts from all over the world. A qualified artist, Kesav Rao has done P.D. 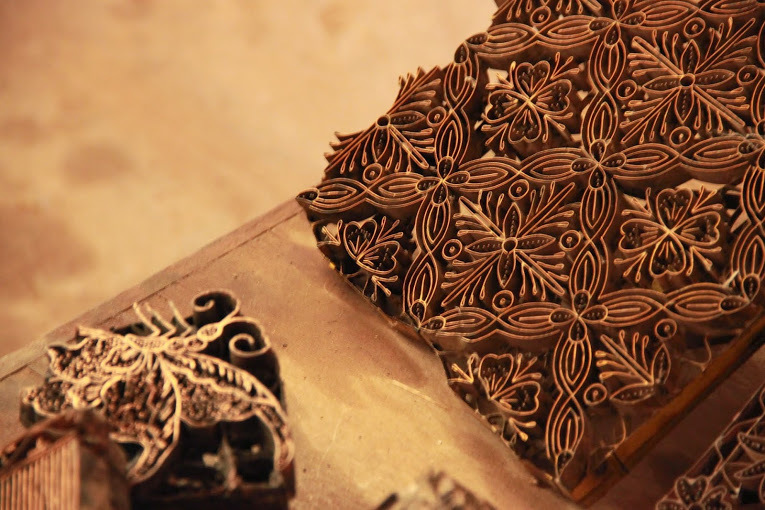 Graphics from MS University, Baroda, Gujarat and mastered the techniques in designing, painting, print making, natural dyeing & hand-block printing. He works with oil on canvas, natural dye on silk, ink & water colors, dry pastels & charcoal on paper. He showcases his work within the country and abroad. An advisor on a number of state & central projects & committees of the Govt. 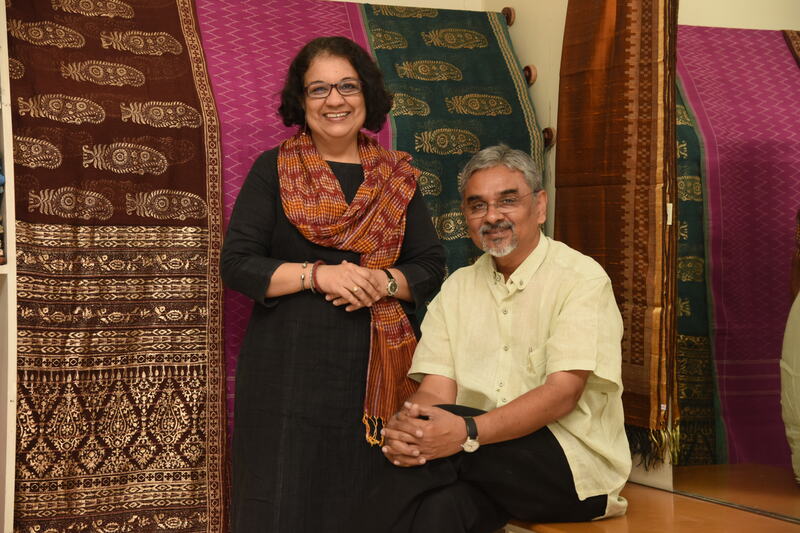 of India including the Ministry of Textiles and a member of the World Crafts Council, Bina Rao has been working extensively towards the healthy growth of Handloom & Handicraft Sectors of India & South East Asia. She also lectures and showcases her collections at international symposiums and Museums all over the world. We established the studio because when we started off in 1998, Hyderabad did not have any facilities for art and design that a freelance designer could use. 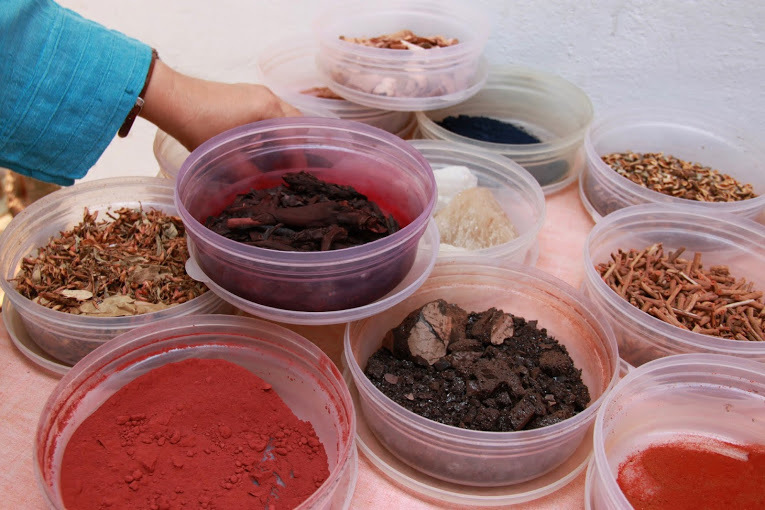 We then set up a library, computerized studios, looms and a natural dye & hand-block printing unit. We faced quite a few challenges owing to the lack of an education or background in business, especially finance and accounting. Striking a balance between retail, customized, export and bulk orders was also a difficult task that took some time to stabilize. That being said, it has been a very fulfilling journey for us, as we are able to provide sustained work to about 450 handloom artisans and have been providing them fair wages. This has played a major role in keeping them from leaving the profession, sustaining their families which in turn allowed us to create fresh products continually. What are the priorities for the company in the coming days? What does the future hold? With increased eco-friendly awareness, there is great potential for growth of businesses such as Creative Bee. The pace of growth has been and is fairly slow given the nature of the skills at play. Weaving by hand is time consuming but there is plenty of demand for these products both in India and abroad. The support of the government to improve the infrastructure available to handloom artisans will play a major role in the kind of contemporary products that India will produce for the world. Posted in Artist, block printing, Crafts, fashion, Incredible India, India, indian, inspiration, Jaypore, Natural, Organic, style, Textiles, traditional, Wondrous India and tagged artisans, Bina Rao, Block-printing, contemporary, Crafts, Creative Bee, Creative Bee Foundation, designers, dyes, eco friendly, fashion, handcrafted, Handloom, Handmade, handspun, India, Indian, Kalamkari, Kesav Rao, Natural, Organic, Textiles, Traditional. Bookmark the permalink.